YOU GOT THIS (YGT) provides mental health self-care activities to foster hope and social connection for New Orleans’ creative community. You Got This is a compassionate, inclusive performing arts mental health outreach program designed expressly for our creative community, including music, dance and art students, to help calm suicidal thoughts, feelings and plans by promoting optimal mental health self-care. We advocate for COMMITTING to LIFE. We are creatives helping the creative community by advocating for a mindful path to eliminate old patterns by traveling a healthy new path. YOU GOT THIS! YOU ARE NOT ALONE. Give our new resource a try and find out how you can feel your best! YOU GOT THIS is directed by a New Orleans Musicians’ Clinic and Assistance Foundation (NOMC&AF) community task force in collaboration with local and national mental health and international performing arts medicine advocates to increase access to trusted self-care resources that are confidential, supportive and clinically effective. Our intention is to work with universities, art schools and conservatories to create healthy cultures that support mental health while reducing the prevalence of suicide among our valued creative artists. Sign up for the You Got This email list to receive updates! Compassionate mental health self-care events. Open to all. Weekly gatherings during the season of Lent hosted by our partners at Southern Rep Theatre. Event includes live music, healthy food options and therapeutic services. Healing Happy Hours focus on mental health and self-care while offering a sober, safe space to foster connections and share ideas. Each event is immediately followed by a Care For Creatives Healing Power Hour in the same location, so we encourage you to attend a whole evening of wellness events! RSVP ON FACEBOOK. Email info@nomaf.org for more. The You Got This program hosts weekly wellness events in New Orleans, open to all local creatives and performers for low or no cost. Each event creates a safe space for self-care for to those who may be suffering from mental illness or just trying to relax and enjoy community connection. The You Got This mental health outreach program advocates for self-care. Taking care of your body, through healthy diet and exercise, and giving yourself time to move and relax can have huge effects on your overall mental wellbeing. The majority of events take place through our Care For Creatives partnership with Southern Rep Theatre. 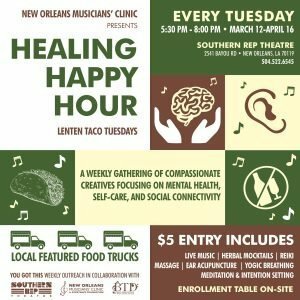 The NOMC’s You Got This Program, in partnership with Southern Rep Theater’s Care For Creatives program, provides wellness events in the New Orleans creative community through Healing Power Hours, Wellness Workshops and Sunday Brunch Talks. Visit the Care For Creatives Website to learn more. Download program brochure here (PDF). It is SAFE to speak up when you are suffering. In the USA there are more deaths to suicide than to homicide. Countless studies reveal that those endowed with the creative gift are more likely to suffer from depression and anxiety. With 60 percent of suicides directly linked to severe depression, the problem is clear. Suicide is preventable with early intervention when traumatic life events occur or when long-standing depression is not adequately treated. People around the depressed person need to intervene when ANY indication is given that the person has given up, has made plans to distribute his personal effects or made efforts to acquire the means to kill himself. A suicide happens in the USA every 15 seconds. Our YGT task force realize that those struggling with depression may withdraw from friends and family and make it difficult to reach out to them. Efforts must be made to bring help to those suffering from depression. Concern, support and referral to mental health professionals could mean the difference between life and death. On July 1, 2018 the NOMC team presented a call to action about the growing suicide epidemic in the creative community at the Performing Arts Medicine Association (PAMA) ‘s annual conference. The panel, named after the NOMC program YOU GOT THIS and led by NOMC’s Co-Founding Director Bethany Bultman, featured one of the authors of the Australian study on creatives and mental health, Dr. Mark Seton; Jennie Morton, the British author of numerous books on performance wellness; Dr. Patrick Gannon, San Francisco psychologist who is our You Got This advisor, and renowned musician and songwriter James Blake speaking out about this crisis. One-half of all chronic mental illness begins by the age of 14, three quarters by the age of 24. Serious mental illness costs America $193.2 billion in lost earning every year. 90% of those who die by suicide have an underlying mental illness. Suicide is the 10th leading cause of death in the US. Nearly 60% of adults with a mental illness did not receive mental health services in the previous year. African American & Hispanic Americans used mental health services at about 1/2 the rate of whites in the past year and Asian Americans at about 1/3 the rate.